I had a half-batch of picadillo left over from my first empanada attempt (more on that later), and I wasn't sure what I wanted to do with it. In the past, we would scoop it up with flour tortillas, but I got out of the flour tortilla habit after I moved to Chicago and could not find a whole wheat flour tortilla to save my life. By the time they did appear, there was only one brand available and I could taste whatever additives they used to preserve them. I could have used corn tortillas, and that is what I decided to do. And somewhere within that decision, after I had brought the corn tortillas home with me, came the idea of making enchiladas. I thought it would work out really well to wrap the picadillo and some cheddar cheese in the tortillas and top it all with a lovely tomato enchilada sauce. I already had some sharp cheddar in the refrigerator so I decided to go with that. With many enchilada recipes, you fry the tortillas in oil to make them pliable. I never liked to deal with the mess of that, and I also wanted a healthier alternative. I found a recipe (I believe on the back of some taco seasoning a housemate had bought years ago) that called for dipping the tortillas in the enchilada sauce to soften them up and I liked that idea much better. I have been doing it that way ever since. That may be more of a Tex-Mex way to make them, I don't know. I just know I like them that way. But as I was working out the recipe in my mind, I realized that the tomato sauce needed something more. Something meaty. Something like . . . picadillo. That would work, but then what would I put inside the enchiladas? I didn't have many options in the refrigerator or the pantry, so I thought maybe I could just fill them with onions and cheese and top them with the picadillo-tomato sauce. There's something to be said about a cheese-onion enchilada. But then I thought about the delicata squash I had bought a few days earlier. I had no specific plans for that, and I started to wonder how it would go with the other ingredients. The more I thought about it, the more I liked the idea. So I cut it in half lengthwise, scooped out the pulp and seeds, and roasted it in the oven for about 20 minutes. 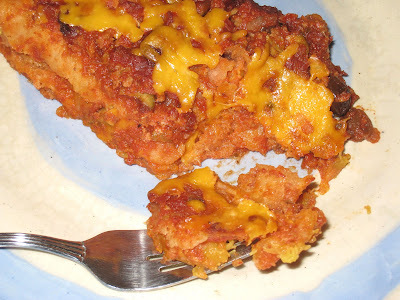 I didn't want it to get too tender because it was going to bake again with the enchiladas. It came out better even than I had anticipated. The smooth sweetness of the squash was balanced by the gooey sharp cheese, and the piquant picadillo sauce brought the whole thing together. It takes a little time and effort to make the actual enchiladas, but it's easy and it moves quickly and they're done before you know it. And the end result is a hearty, satisfying meal. I hadn't made enchiladas in a long time, but now that I have started again I do not intend to stop. This is another one of those dishes where, once you figure out the basics, there is no end to the possibilities. You can change the sauce, the fillings, even the wraps to match your mood, or what you have on hand. As comfort food on a cold windy day, there's nothing better. Heat oil in large skillet over medium high heat. Add onion, season with salt, and cook for 2 minutes. Add garlic, green pepper and celery and cook another 3 minutes, until the onions are translucent. Add the tomato paste and, stirring to mix it into the vegetables, cook for a few minutes until the color has deepened. Add cumin and stir for 1 minute. Add ground beef, oregano and dried peppers. Season with more salt and brown thoroughly, breaking it up so there are no clumps and it is thoroughly mixed into the vegetable mixture. If the mixture becomes too dry, add water in small amounts at a time. Add olives and raisins and cook until heated through and the raisins have plumped some. Add almonds and cook another minute. Serve hot. Pour pureed tomatoes into a 3-quart saucepan over low heat. Add oregano and water and bring to a simmer over low heat. Preheat oven to 350 deg. F. Remove sauce from heat and place on a heating pad on the counter, with the baking dish nearby. Using a plate or cutting board as a work space, grab a tortilla with tongs and dip it into the hot tomato sauce, making sure it is completely covered. Leave it in for just a few seconds, shake off the excess sauce, and lay it on the plate. Spread a small handful of cheese down the middle of the tortilla. Layer some squash on top of it. Take one end of the tortilla and roll it lengthwise around the squash and cheese mixture. Place seam side down in the baking dish. Continue making the tortillas, placing them in one layer in the dish. When all of the enchiladas have been prepared, return the pan with the remainder of the sauce to the burner and add the picadillo. Bring to a simmer and cook for about 10 minutes, until the flavors have blended. If the sauce becomes too thick, thin it with a little water. 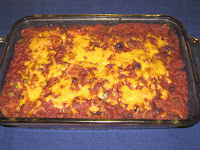 Pour the sauce over the enchiladas in the baking dish. Cover with foil and bake for 30 minutes. Remove the foil and top with the remaining cheese. Bake another 20 minutes, until the cheese has browned and melted.